If you were following this back in April, you may remember what Stan Honey wrote about his repairs with Illusion. "On Illusion, early in the period when we owned her, we noticed water weeping into the bilge from that area, and when the boat was hauled out, we noticed some areas between the hull and the shaft log that were slow to dry. Illusion had the fiberglass shaft log from the beginning, so that wasn't the problem. We ground into that area from the outside and found very poor glass work and lots of "bog" with no glass. Understandably it is so skinny back there that it was hard to do a good layup into the female mold when the boats were built. From the outside we ground out all of the lousy glasswork and bog in that area, back to solid laminate, and then re-laminated from the outside with epoxy. It was easier than it sounds because working from the outside there is easy access. I think it is worth fixing properly and I'd consider it to be a possible structural problem. As I understand, some folks believe that Tangent was lost because she came apart in this area, but of course nobody really knows. It was a surprisingly easy fix working from the outside." "We had the same problem with Belle Aurore that Stan described, only worse. In 2009 while transiting from the Chesapeake to Marblehead for the Halifax race, we noticed the bilge pump was cycling on every so often. I didn't think much about it as the weather was miserable, pouring rain, wind on the nose, lots of wet people and gear moving into the cabin, etc. The icebox drained to the bilge as well. After starting the race, noticed that the leaking was increasing to the point the pump was running every 10 minutes or so. Ultimately it became severe enough that we decided to abandon the race. We discovered a 4 inch horizontal tear had developed in the glass directly above the shaft log. Evaluation by a materials expert indicated that the process Cal used in manufacture wasn't ideal. The insert of those "casings" that create the hollow for the shaft log create a hard spot in the glass, which combined with the poor glasswork above, caused the glass to delaminate & ultimately tear. We were definitely lucky in that the aft bulkhead in the keel was fairly watertight and limited the inflow." 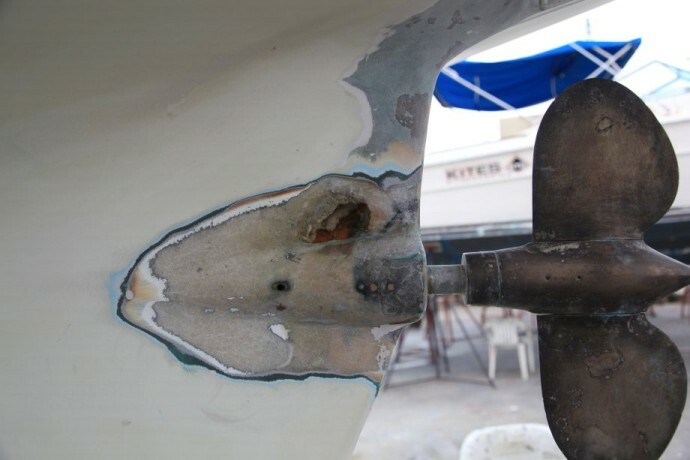 "In my experience, there have been problems with the center seam in the boat. Partly due to old age and partly due to the way the boat was built. 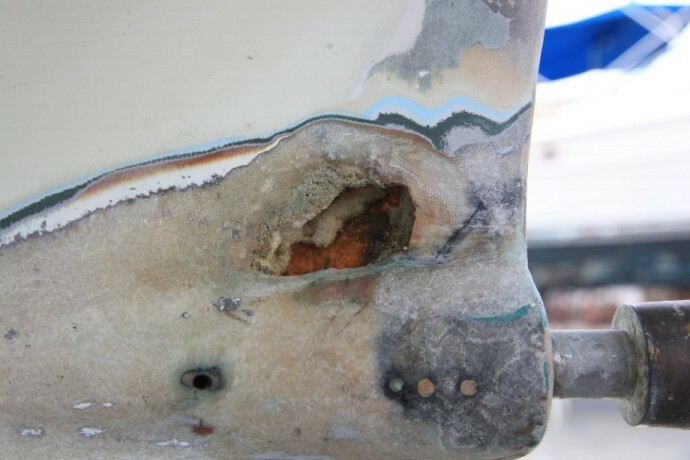 My bet is somewhere along the center line joint from the rudder post to the aft edge of the keel fin, there is a crack / defect that is letting the water in the boat. 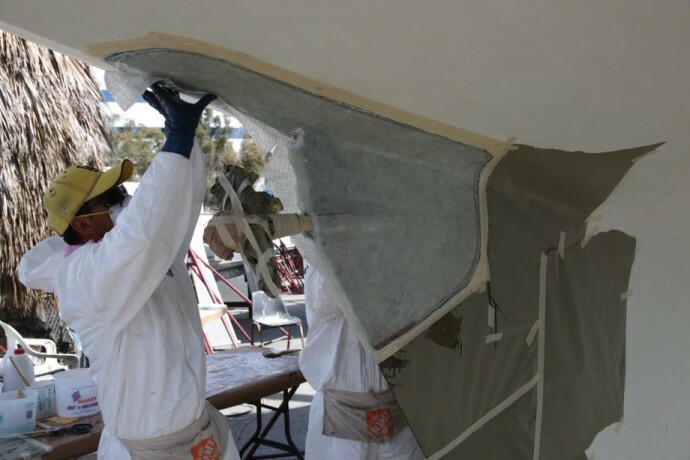 Then the tricky part is that it travels between the layers of fiberglass an comes out is some random spot inside the boat. 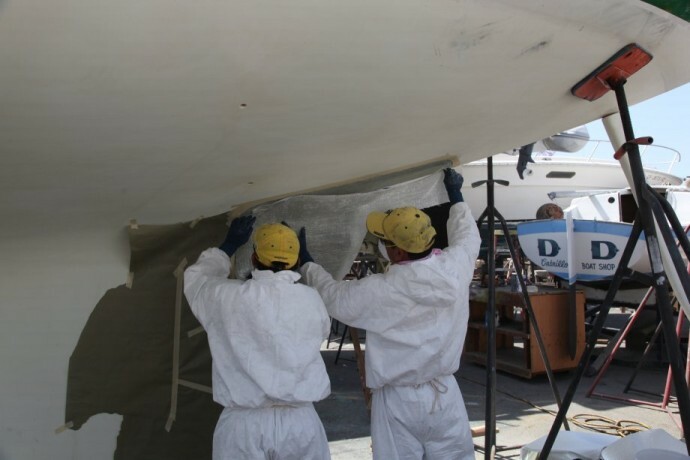 For example, it could be leaking at the shaft log / tube, the water finds its way in the and then runs down a void and exits somewhere, on the inside aft seam in the keel." As I have admired his work for many years, I turned to Alan Andrews (Naval Architect, http://www.andrewsyacht.com/ ) to determine what would be the most appropriate fix for Radiant. 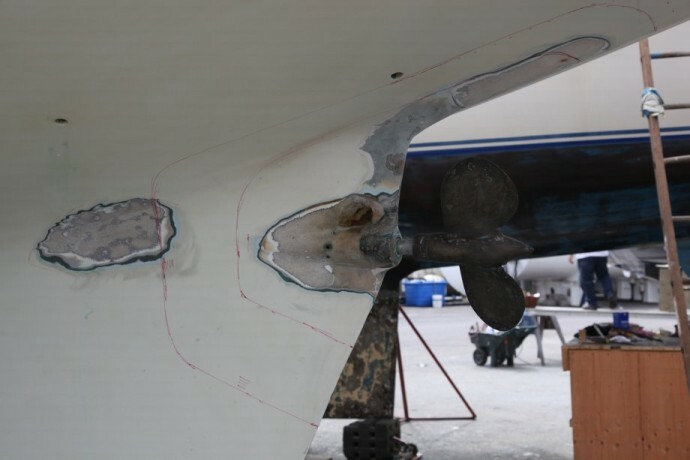 "The laminate in this area is very thin?.Over time and with prop loads, it appears this is just too thin for what is essentially both the prop strut and what the boat is set on when hauled. The existing laminate appears to be just Mat, Cloth, Mat, Cloth, Roving and less than 1/8" thick. The laminate specified here should be about .36 inches thick ?. 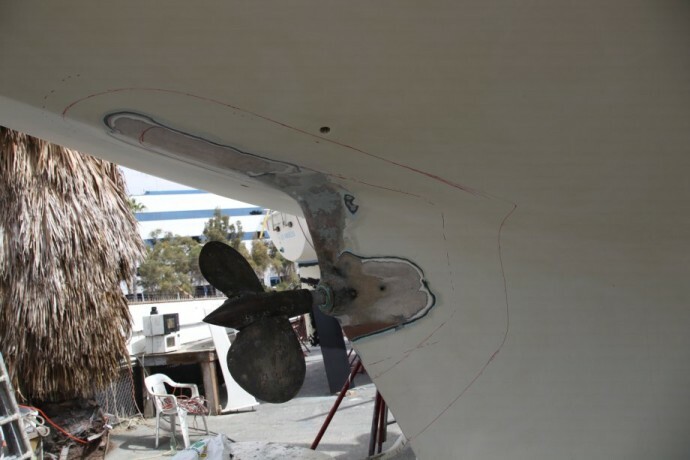 The result may mean removing more of the laminate above the shaft tube and below the hull in order to build this thickness further towards centerline and still keep the fair keel shape. (Increasing the thickness but keeping the original outside shape)." It's a funky yard, but I've always been treated well by Don Holland at Cabrillo Boat Yard, so that's where the boat was hauled. 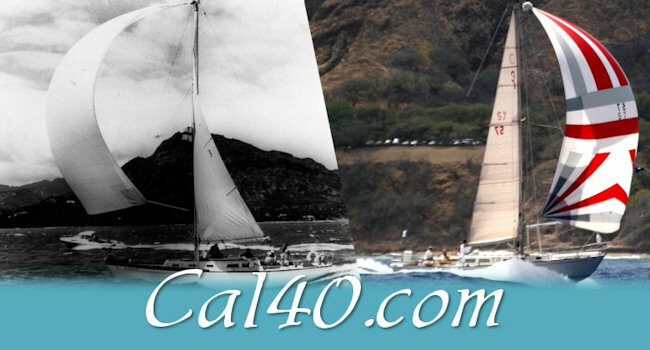 http://www.cabrilloboatshop.com/. Also, it's only about 2 miles from the Dencho shop. As this could possibly occur on any Cal-40, I thought you might find these pictures interesting. They started on Thursday, and this is where they were at about 10 am on Friday. I'll take more pictures later today, and will pass them along. The primary area of weakness, just above the propeller tube. After a little grinding, this is what they found. Port-side area to be re-laminated. The guys from Dencho Marine laying on one of several laminations. And a look at the starboard side. Several layers of glass.